The Nile was a three-masted early frigate ship built at Sunderland in 1849 for Duncan Dunbar. The Nile (official number 10726) was 763 tons; 133.5 ft. length; 32.5 ft. breadth; 21.5 ft. deep; 15.0 draft. According to two sources (Lloyds and CLIP), she was abandoned in late 1880 with no reason given. 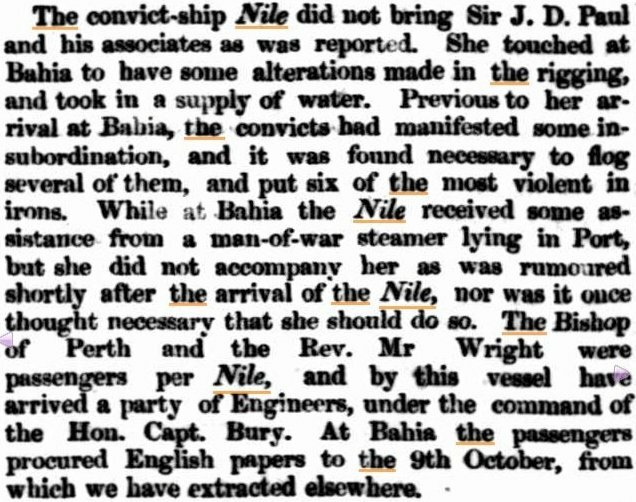 In 1858 Nile was employed as a convict transport and left Plymouth, England on September 23, 1857 bound for the Swan River Colony, stopping at Bahia, Brazil en route. 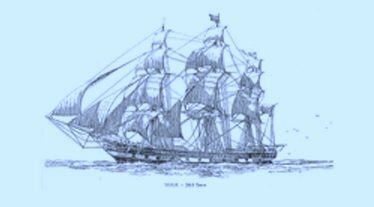 She carried the 19th of 37 shipments of male convicts destined for Western Australia. The voyage took 100 days and arrived in Fremantle on January 1, 1858 with 268 convicts (two had died on the journey) and at least 60 other passengers. W. Johnson was the captain of the vessel, the ship’s surgeon Robert Whitmore Clarke, RN. 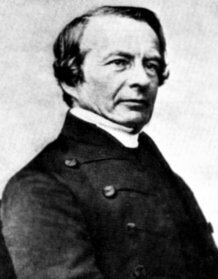 Rev Mr John Wright was religious instructor. There were no enrolled pensioner guards on the voyage. However, a small contingent of Sappers & Miners (27 men and three officers) and ten Warders appointed in England to take up employment at Fremantle Prison, were expected to assist in the supervision and control of the convicts. A convict insurrection on the voyage between Plymouth and Bahia proved a frightening experience, and although ultimately quelled, it is clear that the warders in particular were unprepared for the trouble. Seven of the convicts were veterans of the Crimean War, as were five of the Sappers & Miners who were guarding them. These rank and file soldiers, now part of the 20th Company of Royal Engineers, were John Burns, John Collis, Alexander Gray, George Hopkins and John Wade. Janice Hayes (nee Hale) a descendant from a cabin passenger on the Nile has provided two transcripts of personal letters written by Mathew Hale, the Bishop of Perth, Western Australia. Hayes’ transcripts give an insight into convict behaviour as Bishop Hale described periods of unrest on board before he joined the Nile in Plymouth and in the months that followed. 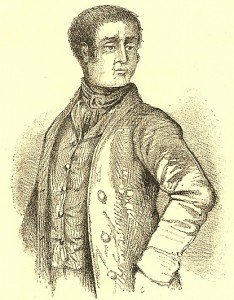 Two of the ten Warders – James Cavanagh and Daniel Kirby – were dismissed and disembarked (we assume with their families) at Plymouth after each refused to undertake any further duties on board. This is confirmed by both Bishop Hale in his letters and David Barker in his Dictionary of Warders & Gaolers. A Daniel Kirby came to Western Australia in 1864 from Singapore (Erickson) and took up a position as assistant warder (Barker) for approximately six months, but whether this is the same man is not known. Of the eight warders remaining on board the Nile, six had seen service in the Turkish Contingent and received Turkish-Crimea Medals. These were William H Downe, Francis B S Flindell, James George Flindell (son of Francis), Thaddeus Moriarty, John Pye and George Wilmore. One of the convicts on board was something of a celebrity. Edward Agar ‘the approver’ was perpetrator and leader of the ‘Great Bullion Robbery’ of May 1855 when bullion destined for British troops in the Crimea was stolen from a South Eastern Railway mail train. 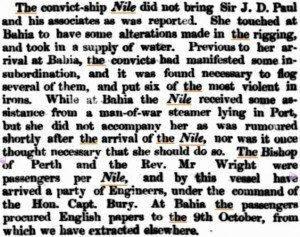 The Perth population, hungry for news of the Indian Mutiny, were able to ‘read all about it’ in newspapers brought by the Nile from Bahia. The Crew List Index Project (CLIP). Royal Engineers’ Expedition to the Swan River Colony p.19, by Derrick Prall 2001. The Bicentennial Dictionary of Australia Vol 3, Rica Erickson. Warders and Gaolers Dictionary of Western Australian Prison Officers, David J. Barker. 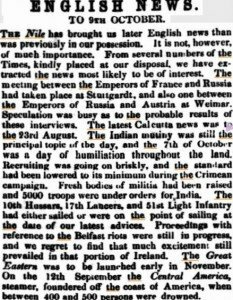 Inquirer & Commercial News 6 January 1858.